Microsoft has confirmed that the programs formerly labelled Office 14 will ship to manufacturers by January 2010, with no public beta of the software suite likely to be issued. Reports at the weekend had pointed to both the name change and the ad-supported slimmed-down online versions of the likes Word, Excel, PowerPoint and OneNote. Chris Capossela, a Senior Vice President for Microsoft, confirmed that a release to manufactures would happen next January, but added that it could take anything from six weeks to four months to reach consumers. The non-advertising (and non-cloud) version of Office 2010 has not yet been given a price point, it was also confirmed. An announcement was made that the programs would be released as a 'technical preview' to 'thousands of users' but not as the kind of public beta that has pushed Windows 7's profile so readily. 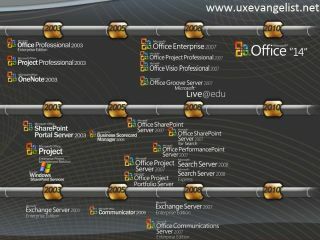 Office 2007 – the last major upgrade to Office – had two betas as well as letting users trial features in their web browsers. As you may expect, there will be both 32-bit and 64-bit versions of the software.